Even though the country is expected to issue new state bonds next year to tackle state debts Prime Minister Alenka Bratusek suggested that Slovenia does not require loans immediately. Slovenia will have to tap the market but there is no reason to hurry as the treasury still has EUR 2.5bn on its accounts after the bank bailout, Bratusek told reporters after the EU summit in Brussels. 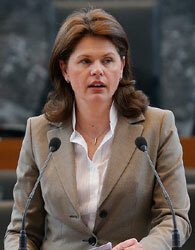 She pointed out that the price of borrowing has dropped after the bank bailout plan was approved by the European Union.